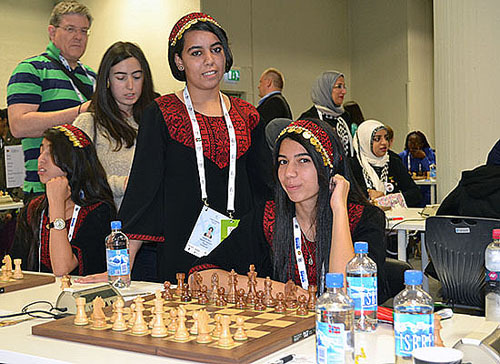 The 2014 Chess Olympiad kicked off with the usual fanfare and excitement. The bustling of the teams greeting one another and of course finding their boards. For some it would be their first international tournament. Others have had enough appearances to write a book. In fact some Olympians have done such that! The first round is an interesting encounter although not much is expected of the lower-rated teams… perhaps a board upset. In fact, it was (now GM) Alejandro Ramirez who nearly shocked GM Alexander Morozevich when Costa Rica faced Russia back in 2002. Morozevich escaped with a draw and Ramirez’s star was born. Opening move of the 2014 Chess Olympiad. In today’s match ups, most were 4-0 accounts, but there were a few such upsets. In Nicaragua-Latvia, one was interesting because it featured two IMs… one rated 2156 and the other 2496! Despite this inconsistency in how titles are earned, the lower-rated IM won. Greece gave up two draws on the top boards as 2600-rated GMs were held by Botswana. Jamaica’s Damion Davy (2164) drew with Slovakia’s Jan Markos (2602). Zimbabwe’s IM Rodwell Makoto scalped GM Enamul Hossain of Bangladesh. Not a major upset, but enough for a compatriot to make a video. Daniel King pointed out in his “Play of the Day” videos the stark contrast between amateurs and professional players. It was certainly on display and these games can be instructive on how to exploit mistakes since strong players are ruthless in this regard. One of the first games to finish was in Russia-Jordan, a game ending in 16 moves. Beautiful outfits by the Palestinian players who must have so much on their minds at this time given the turmoil gripping Gaza City. Photo by ChessBase. The women’s competition was almost identical with no team upsets and a few individual upsets. In fact, Norway’s top player WIM Sheila Sahl, took a loss against 1989-rated Chengjia Wang of South Korea. Must have been devastating to lose on such a grand stage in front of millions of onlookers. South Korea has a player on the ten who is 10-years old! Her name is Yubin Kim and she is seen briefly in the video below. While many of the top players rest in what is considered an easy round, Kateryna Lagno got her first victory for Russia beating Jordan’s Lougain Dahdal. This is a relief given the controversy leading up to the Olympiad which the Russian women being initially disqualified. Everything seems to be going smoothly and we look forward to the stars shining and others to be born. GM Jan Gustasson and IM Lawrence Trent.